I first heard about the Word of Promise on the Laura Ingraham show last Friday. She had Jim Caviezel on her program and he talked about the Word of Promise which is a audio Bible of the New Testament. Laura played some excerpts of the Bible on her show and I knew I just had to have it. I ordered the audio Bible from Amazon on Saturday and today it arrived. I have listened to a few chapters of it and I really liked the way the New Testament is presented; in dramatic audio theater style. 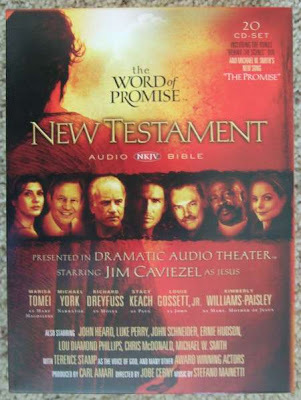 Some of the voices in this audio Bible, besides Jim Caviezel, are Stacy Keach, Michael W. Smith, Lou Gossett Jr., Lou Diamond Philips, Richard Dreyfuss, Marisa Tomei and Michael York who is the Narrator. There are a few others of course. If you want to hear a sampling of the audio Bible you may go to the website http://www.thewordofpromise.com/wp1/. You can also buy an MP3 version of the Bible from the website itself. I can assure you that it will be a very good investment. You don't have to waste your time in the car listening to useless stuff, instead you can listen to the New Testament. The version that is used for this audio Bible is the New King James Version. It's MICHAEL W. SMITH, not Paul W. Smith that's on the recording. Ooopss, got the wrong Smith! Thanks. Nice...thanks for info..will try see whether they sell it here. 1) When you purchase on the site, you have the option to select your church or ministry in the check out process to receive a 10% tithe of your order. This is their Pay it Forward Program and churches everywhere can benefit when someone signs them up during the check out process. Churches will then receive a check at the end of each quarter for purchases made. Pretty cool considering the retailers just take the money - this site gives it back to the churches. 2) The download you mention is the best deal on the web and when you purchase the download you also get to download the 36 minute Behind the Scenes DVD that comes in the pack and the Michael W. Smith "The Promise" song. What a deal! 3) They also just started carrying a new documentary movie on the Star of Bethlehem. Pretty cool. Thanks again for your kind words about the website. This is the official website of the Word of Promise project. I am happy to promote the Word of Promise. I am thoroughly enjoying my audio Bible. I didn't think about the Pay it Forward Program when I made my purchase. Otherwise I would have ordered from the website. I stumbled onto your blog and read about the word of promise project. sounds cool except the translation is the new king james version which is pretty antiquated isn't it? I wonder if all those actors are Christians? My friend is using another hollywood audio Bible and loves it, it's called the Experience I think. She uses it all the time and raved about it. I saw where the "Anonymous" post came in and was raising some doubt about translation and about the actors on the project. Its a shame that posts like this are being made and we aren't focusing on the fact that this is the Bible and done at a level that will impact lives around the world. Its not about the actors and or the translation as much as it is about evangelism and enriching people's lives. I've seen posts like this on other sites and have good reason to believe it isn't a consumer but rather another competing Bible publisher masking as a consumer because of the consistency of what they say on blogs like this and the fact that most consumers don't focus on the issues this person raises. I hope I am wrong but it would be pretty sad to think someone is masking themselves as consumers with the intention to raise doubt or discredit about any Bible project. Personally I think people can enjoy both and they should make that decision for themselves which one they enjoy. At the end of the day isn't it about enjoying and incorporating the Word of God into our lives better? Why does there have to be a discrediting or competition of Bibles? That seems to be counter intuitive to what the Bible teaches anyway. That might make a good Blog story sometime to post on. At the Word of Promise, we don't participate in any bashing or discrediting of other products. If our Audio Bible isn't what someone is looking for then it isn't meant for them. The project was created to reach the world. We know some will reject it and others will experience it for the first time. I'm personally thankful we have people getting back into the Word of God or being introduced to it for the first time. The letters we have received about Atheists being converted, or the blind being able to enjoy the Bible, to new believers coming to know the Lord are all worth it in the end. Thanks for listening and I hope our "Anonymous" friend will take a hard look at what they are doing and not raise doubt for others but encourage people to get into the Word no matter which translation or recording they choose. There should be unity in reaching the world with the message of God. No, the New King James Version is not an antiquated language. You must be thinking about the King James Version which is written in old fashioned English, I find that version a little hard to follow too. I am glad your friend is enjoying the other version of the audio Bible. I think for me whatever version is used, the important thing is that the Word of God is received, and people's hearts and minds are being transformed by it. I hope you are wrong about the comment earlier being written by a competing Bible publisher. Bashing one project in order to promote another project just doesn't seem right. You are right - people can choose whatever version they feel comfortable with, and that is their choice. Whether one feels one version is better than the other, that is a personal choice. In the end what it intended is that one grows in faith, and one is blessed by God's Word. We should all work together to promote God's Word, written or audio. Before I decided on the Word of Promise, I had been contemplating another audio NT. I am glad I made this choice because like I said earlier, I am thoroughly enjoying the Word of Promise, and I would highly recommend it to anyone. I am happy to hear that the audio Bible has allowed the blind to hear the Bible in a totally different way. If atheists are indeed being converted, then all praise be to God! God's Word is indeed sharper than any double edged sword. I am glad that you are throughly enjoying your New Testament audio bible. I just wanted to let you know what The Bible Experience's(the other audio bible) Old Testament was recently released. If you would like to hear some sample clips, please let me know. And I am not posting anonymously.